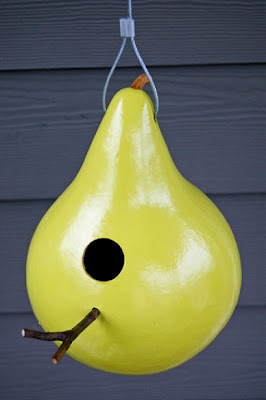 Oooh - I'm loving everything bird related these days...but I especially love the pear shape and eco-friendly design! I love this, wish I had a garden! IT reminds me of a retro cushion I nearly bought last night from Etsy. the way it's positioned in the photo, it looks like a smiley face! How did she hollow the gourd out? I have made these for gifts. Buy the gourds at the pumpkin farm, keep them in a cool place like your basement for several weeks to dry out(just in time for Christmas!). When you can shake it and hear the dry seeds inside, drill a hole in it and pour out the seeds. if you sand it and spray varnish it, you will be amazed - it will look like beautiful burled wood. an instant fave! thanks for the link.